The LightBloc system is designed for total blackout. May be operated by motor or manually with bead chain, crank operated gearbox, or spring roller. Series SB9000 units include shade fabric, headbox, side and sill channels, roller, operating mechanism, and patented fabric retention system (U.S. Patent No. 5,323,831). Close woven fiberglass base textile with sun-resistant vinyl film securely bonded to each side. 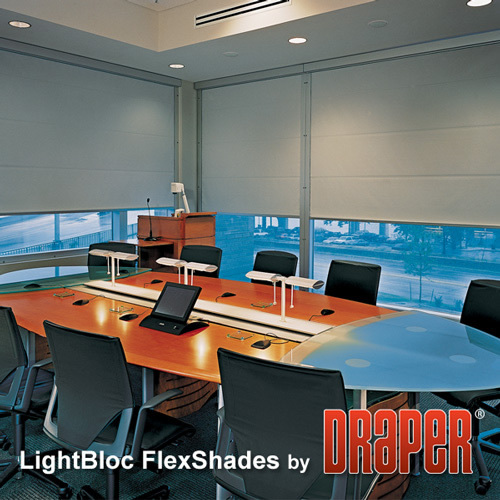 Opaque, fire retardant, washable and stain resistant. Tensile strength 190 lbs. warp x 180 lbs. full. Fire rating: NFPA-701 1006-Test 1. Average Fabric Weight: 12 ounces per square yard. Motorized option available, call for pricing and details.